Born on 27 May 1893 in London, England - son of Sidney and Bertha (nee Veness) Whittick, Cowansville, Quebec - at the time of his enlistment in 1915: present address in Cowansville, Quebec; trade as labourer[? ]; single; no current or previous military service; Church of England; height of 5 feet 10 inches; chest of 37 inches fully expanded; dark complexion; brown eyes; brown hair. 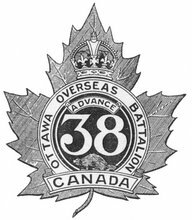 Joined the 87th Battalion, CEF, in Cowansville, Quebec, on 13 November 1915 (number 177670) - taken on the strength of the 38th Battalion, CEF, in England on 14 July 1916 - landed in France with the 38th Battalion on 13 August 1916 - attached to the 12th Brigade Trench Mortar Battery on 16 August 1916 - killed in action on 21 February 1917 while so attached - buried in Villers Station Cemetery (grave VII.C.17), France.